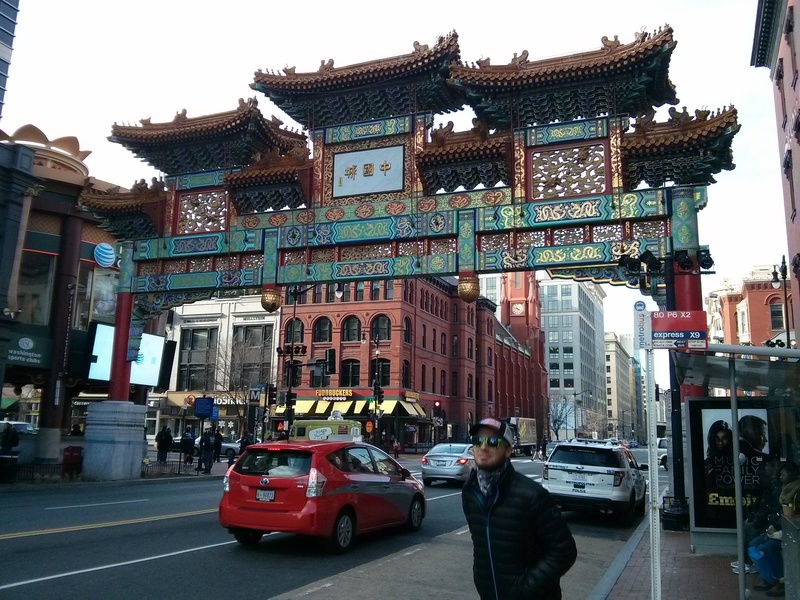 we woke to a beautiful friday morning in chinatown, mildly rested and ready to take on the day. there was food to be eaten and things to be seen, and we weren’t going to miss any of it! we set off on foot through our neighborhood to begin our adventures. as usual for our group, food was the first order of business. 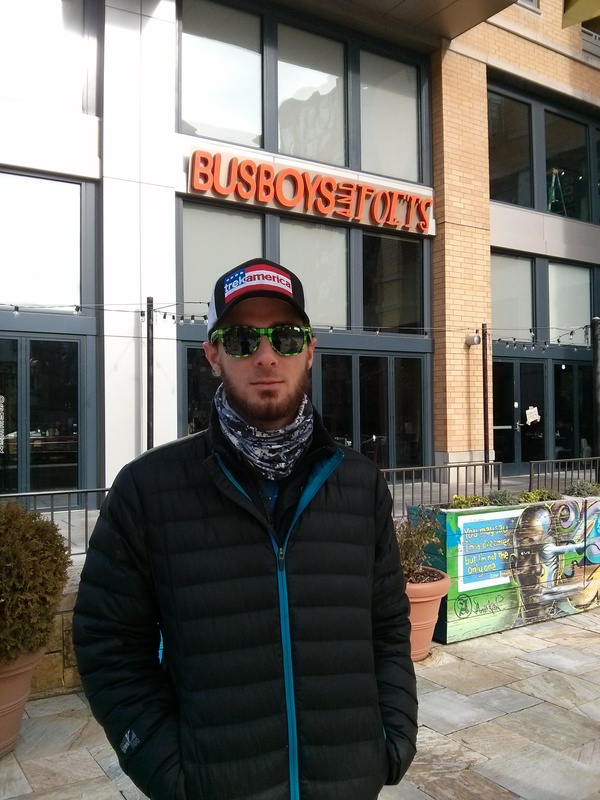 our friend behrle who lives in the city recommended a place called off 5th and k called busboys and poets. well, isn’t that name just the most fun one you’ve ever heard? i think so, too. garth acting like he’s too cool for this picture. please. upon walking inside, a smile came to my face almost instantly, as this restaurant is unlike any i have seen. they have books for sale and reading areas for a cozy afternoon. the space is expansive with its massive winding staircase right in the middle, towering over the bar and keeping watch over its guests. there is seating everywhere, the walls are adorned with local art, and festive lights for the season keep things cheery. our group was easily seated at the wall that shares the patio, away from most of the crowd so that we wouldn’t be too much of a disruption. can we help it that we cause a scene everywhere we go? busboys and poets was “named in honor of renowned african american poet langston hughes.” when he lived in dc, he worked as a busboy at the wardman park hotel. it was when he placed his poems on nicholas vachel lindsay’s table that the world become informed of this man’s talent. now you know! i decided to start the trip off right with a mimosa. it was here where we continued our drink tally from the previous night. the past couple of trips up here we have set a group drink goal for the weekend. genius, right? haha, sure…! this year, with nine people, we were striving for 124 drinks total. ooh, this challenge sounds like one for us! stay tuned to see if we hit our number! 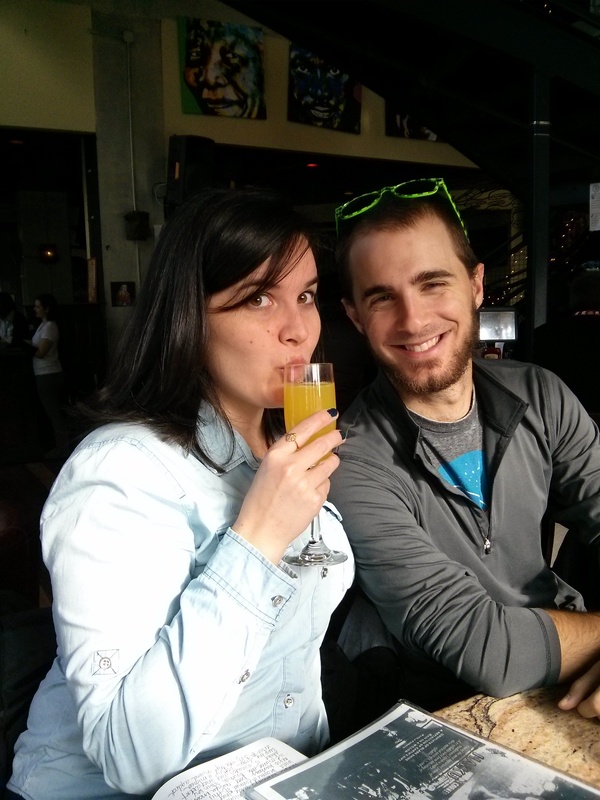 i love my garth, but i also love my mimosas. after the kind waiter took our orders and filled our water glasses, the picture taking began. i had warned everyone ahead of time that i would be the paparazzi on the trip, for a blog is only so fun without pictures to give you a visual reference. we’re pretty adorable, aren’t we? greg & me – coworkers in dc! obligatory things of varying heights picture. 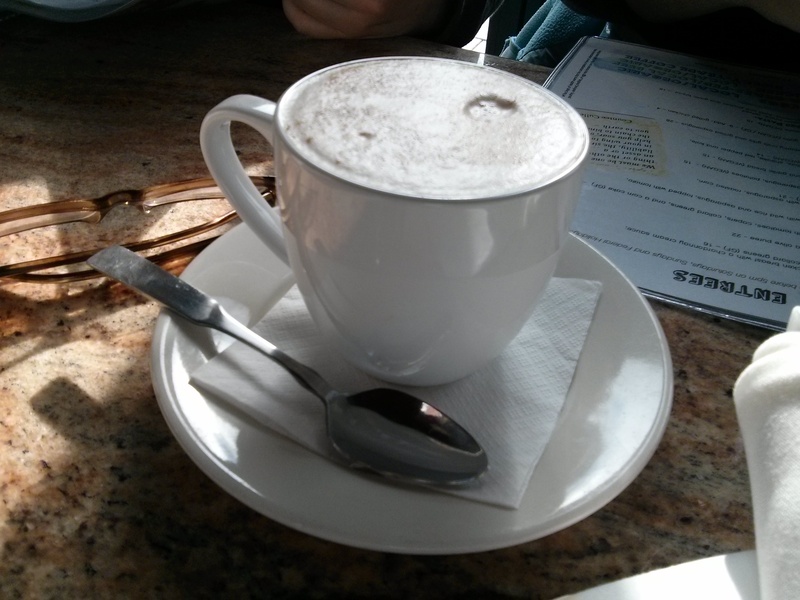 considering the cooler weather, sarah couldn’t keep herself from ordering a cafe au lait, so that is just what she did. she promised me that it smelled as good as it tasted with all that nutmeg and cinnamon, and i believe her. the menu here is pretty varied, and i couldn’t decide what i wanted. we had missed brunch by just 15 minutes, and i wasn’t ready for something too heavy yet. in true kelsey from, i made up my mind on the fly, starting with the shrimp and crab fritters from the starters section. oh heavens, it may have been one of the best orders i’ve made in a while. the fritters were of good size, and the lobster sauce dressing was minimal but perfectly proportioned with the meal. the risotto made the fritters so rich that i didn’t share but one bite with garth. i was quite greedy and wanted them all to myself, and sitting here writing about them now makes me want them again. but maybe two orders, just for me. hehe. i was unsure of how big the fritters were going to be, so i ordered a sandwich to go with it. the grilled brie panini nearly leaped off the page at me, and how could i say no?! i love brie, i love ciabatta. it’s a good decision, yes? well, i did like the sandwich with its hefty slices of brie, but i highly recommend you eat it right when it arrives. i let my hang out as i savored the fritters and wrote my notes, so it was about room temperature by the time i got to it. what a shame! 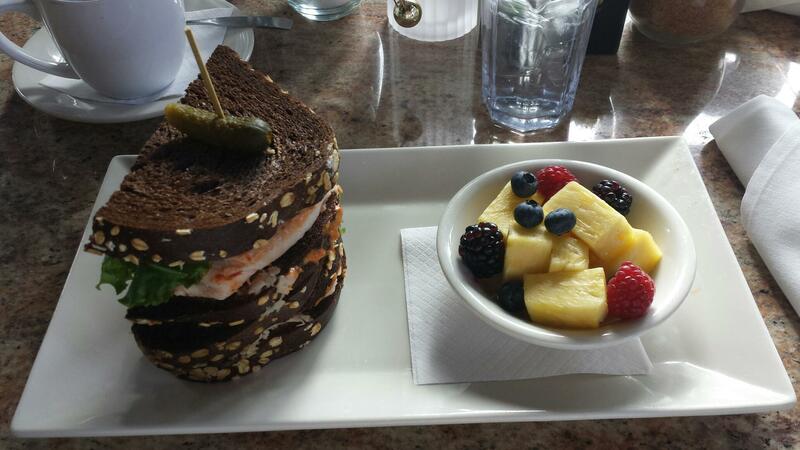 here we’ve got alison’s roasted turkey sandwich and fruit cup. she loved the pumpernickel bread, but it was a pretty large sandwich for just her. she had no qualms about letting her husband finish it off for her. 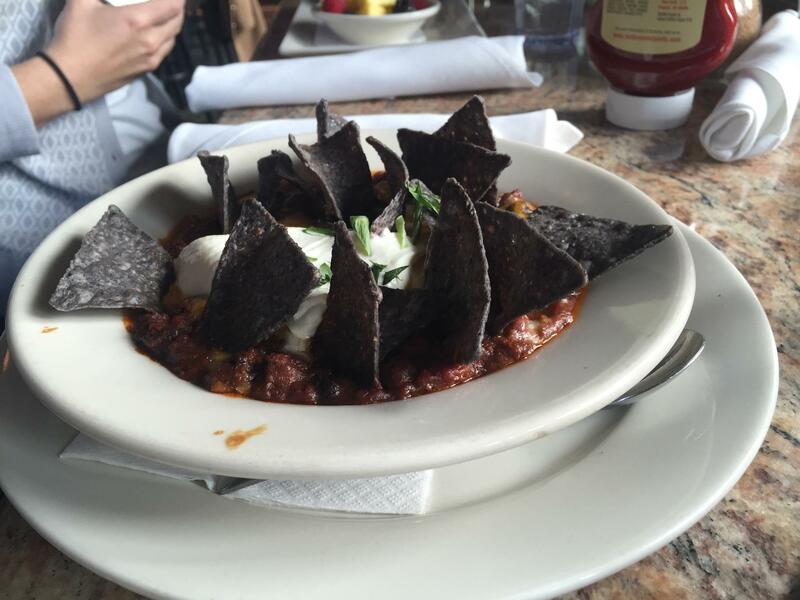 jamie and garth both ordered the bowl of chili, and i was almost jealous right away. it looked so hearty and warming on this crisp december day. 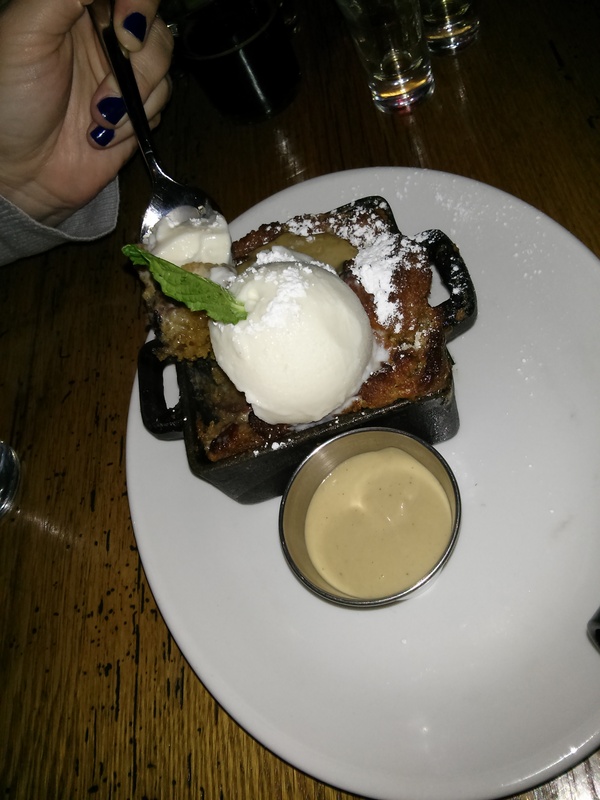 garth sweetly let me have a spoonful, and i would definitely come back for this dish. it had a little kick on the end but wasn’t too spicy that you couldn’t devour the whole bowl. plus, those chips and that presentation are just darling. i didn’t snap a picture of it, but greg had the egg and cheddar burger that afternoon. he liked the fact that the beef was local, and of course he never turns down french fries, but if he had to rate it, which i so kindly had him do, he’d give it a 3 out of 5. not great, not terrible. middle of the road in his books. we paid our checks and bundled up for the elements. i am going to pause here to tell you, if you didn’t already know, that it takes me a long time to get ready. it’s not so much because i’m lazy; it’s more so because i like to take my time and am really never in a true hurry. i’ll scoot out my chair, put on layer one, put on layer two, adjust layer one because of layer two, button up my overcoat, get my long hair situated, throw my crossbody bag over myself, snuggle on my gloves, slip on the sunglasses, and then, yes, i’m finally out the door! man, now that i sit here and read it back to myself, i turned that “bundle up” moment into quite a process. oh well! i know it’s for these quirky reasons that you all love me. after finally getting out of the restaurant, we headed south towards the mall. we were striding along at a decent pace when nathan made a quick left to take us into the national building museum. this one i had not heard of before then, so what the heck, let’s check it out! the most impressive aspect of the national building museum is its grand hall, which houses 75-foot-tall corinthian columns in its 1,200-foot terra cotta frieze. they were decorating the space for an event, so we didn’t get to be up close and personal with the columns, but they are large and tall, and although i would not have been ready for a lengthy tour, i’m glad we went to see it. we continued our walk over to the south side of the mall where we went to the holocaust memorial museum. now, this museum certainly isn’t the most uplifting of visits, but i had requested we go there this year, as i had not been since i was a teenager. this sort of history has always had me mesmerized, and i find it staggering and intriguing that a tragedy of this magnitude actually was carried out on the very earth on which we live today. ground was broken for the museum back in 1985. nearly 10 years later, the museum was dedicated by president bill clinton in 1993. with the hands of elie wiesel and harvey meyerhoff and the president, the eternal flame was lit. it was at that moment when the holocaust memorial museum began to stand as “a living memorial to the holocaust” to “inspire citizens and leaders worldwide to confront hatred, prevent genocide, and promote human dignity.” heavy, i know, but if you have never toured this museum, i highly recommend you do so when you come to the city. it will leave you in awe as you find yourself at a loss of words, unable to fathom these actual occurrences. it didn’t seem appropriate to take pictures, and i don’t want to spoil the experience for you in case you decide to come. after a couple of hours winding through the museum, we threw ourselves back out into the cloudy and cold dusk of dc. 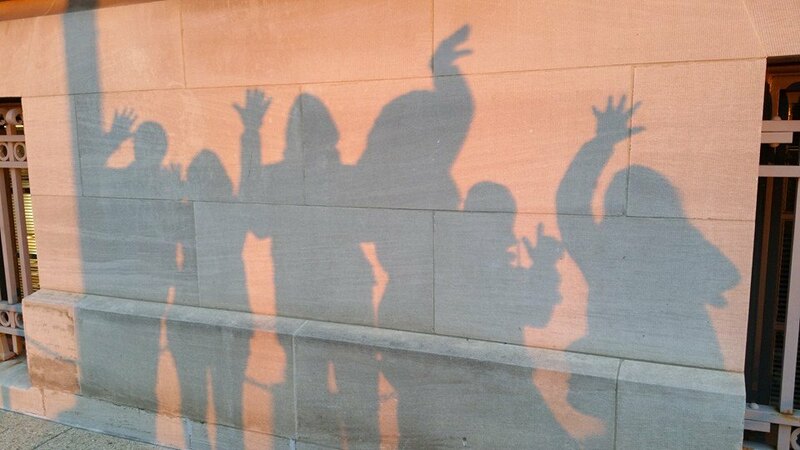 before continuing the journey, i sweetly instructed everyone that we needed a shadow picture, because it’s super cool and ultra hipster. i have no idea who is who. we headed west on foot to meet up with sarah and lenora. our steps carried us quickly, for we were ready to head inside and warm up, but not before seeing mr. lincoln (one of our favorites) and the washington monument. for more dc december tradition, we continued our stroll over to the white house so we could get a look at the national Christmas tree. at times, it’s been a disappointment in the past, but this year the game was stepped up and that tree looked majestic and merry, just as it should have! the train tracks were out like always, also, which made me smile to think back on all the years ago when these traditions began. warms my heart in this cold season, and if you know me at all, it doesn’t take much to get me emotional. oh, wait? is that a tear i feel in my eye? no, not yet! that will come later. we’d had our fill of outdoor activity for the day, so we hustled to dinner over at city tap house. as we came upon its doors, i realized i’d been here a time before, when i was visiting my friend evan earlier this year in april. it’s interesting, because as we sat down and ordered drinks, i pulled up my review from that visit. it wasn’t a stellar opinion, but the good news is that they pretty much redeemed themselves in great thanks to the waiters james and aaron. they were very tolerant of our rowdy group, and i think we kept things interesting for them throughout the night. we had a large group of ten, but nathan, garth, and i pretty much spent the whole evening making inside jokes among ourselves at our end of the table. we were doing our part for the drink tally, so you can imagine we were having fun trying out the local beers. i couldn’t tell you what i had, but i know i liked it. how’s that for a review? ha. we hadn’t eaten since our late brunch/early lunch, so we were ready to fill our stomachs. we split the abbruzzi pepperoni pizza, which turned out to be an excellent idea. it was the perfect size for each of us to have a couple of slices, just enough to tide us over to dinner. 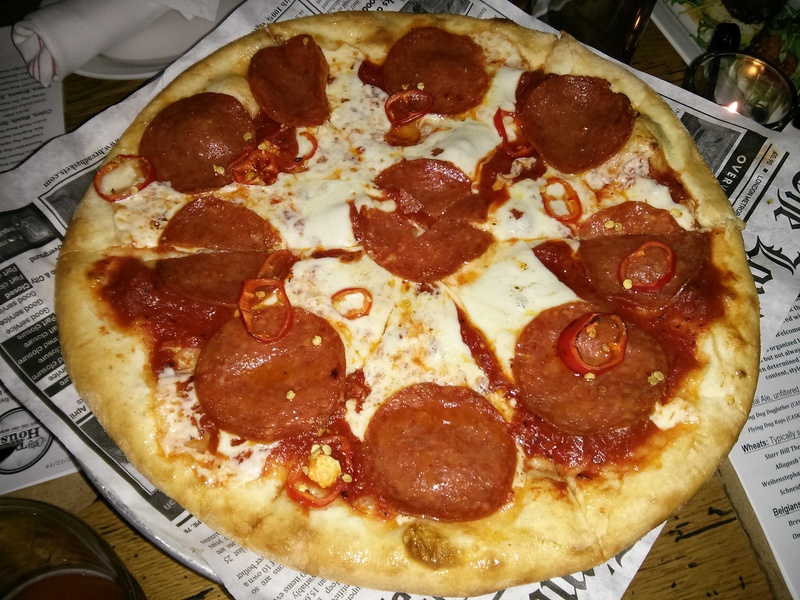 the crust was soft, the cheese was nice and gooey, and the red pepper flakes were just enough heat to wake you up to your senses. i imagine we all three could have ordered that as our entrees and been quite satisfied. right as our pizza pan emptied, dinner was served. nathan, garth, and i were quite adventurous in all ordering the tap burger. we did, though, mix it up, but only slightly. garth had no onions, nathan added bacon, and i had avocado on mine. nathan and garth finished theirs in record time, while i was busy letting mine get cold as i rambled on and on about who knows what. again, i’m sure my review of it would have been much better had i eaten it when it was hot, but i got caught up in conversation and in eating the insanely delicious fries with the horseradish mayonnaise. uuuhh, yes, horseradish mayonnaise. my burger was just fine, although we all agreed that their definition of “medium” is more like “medium rare.” it was a little more pink than i care for mine to be, but as you can guess, that didn’t stop me from eating it, in my own time of course. 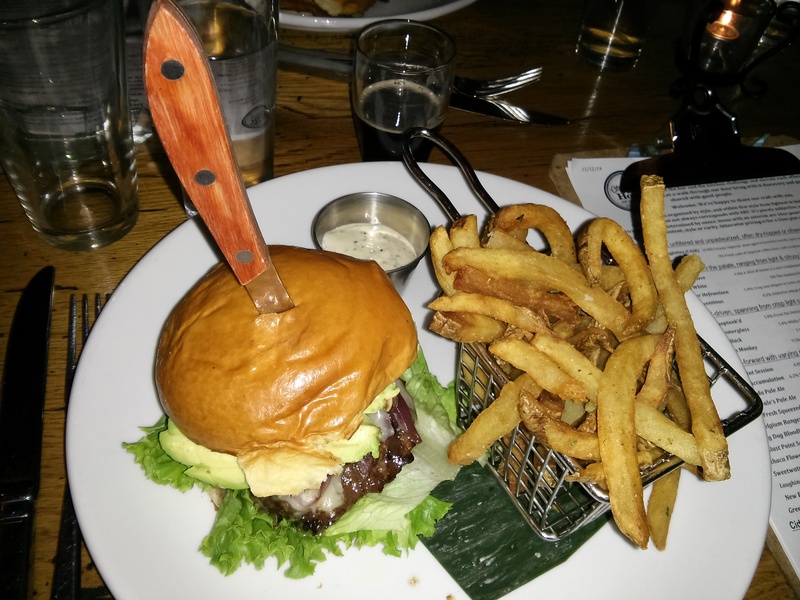 a serious knife for a serious burger. alison topped off our meal with some type of baked doughnut concoction with a sweet creme. i only had the smallest bite, but it was so savory and so christmas-ey that if i’d had room, i would have ordered another. that warm pastry with the cold vanilla gelato was an excellent pairing that we consumed quickly upon its arrival. 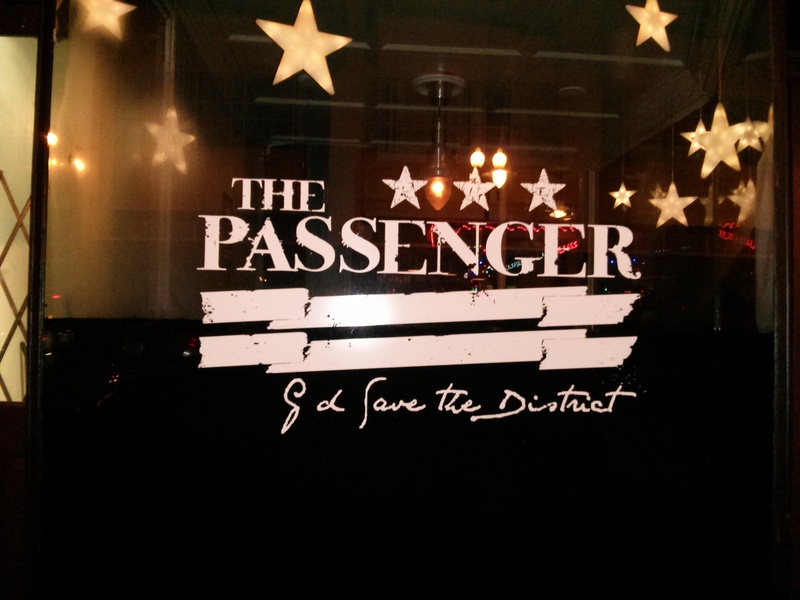 some of us weren’t ready for the night to end after dinner, so behrle escorted us over to one of her favorite local bars, the passenger. the place was already pretty busy, but we got lucky in finding a booth in their tiny little private room. even better, we had a waitress taking care of us so we didn’t have to fight the bar crowd. it’s almost a speakeasy feel in here, all cramped and cozy with your neighbors, but it isn’t so overdone that you feel like they’re trying too hard. our rum and cokes were perfectly made, just the right pour of each. the drinks flowed late into the evening as behrle entertained us with stories of her suitors. we even hopped on tinder just to see what the dc action was like. very different from atlanta, i’ll say that much and leave it there. it was an excellent end to our first day, a friendly gathering with nearly no worry in the world except to figure out if we would walk home or grab the metro.